Our commercial UV water filtration systems are ideal for untreated water at flows greater than normal residential requirements. Designed for large dwellings or commercial applications, camp grounds, food outs and processing facilities, cafes, dairy sheds, wine, beer producers and shopping blocks. 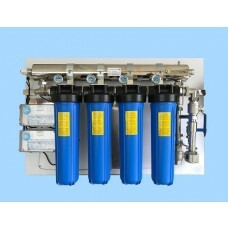 Depending on the media (filters cartridges) used the systems can flow up to 300 Lpm (Litres per minute). We have several installations where flows greater that this have utilised systems running in parallel. So the main supply pipe say 50/100mmor larger is split into 3 or more systems (system connections usually 25/40mm inlet/outlets) then the pipes are reconnected back into a single feed. This has many benefits but allows redundancy so one system can be shut off by use of its ball valves and serviced whilst the others continue to supply uninterrupted water. 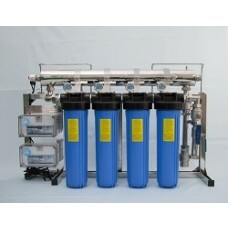 Filter media is customised based on the need and water content but our standard cartridge set comprises of 4 x 20” jumbo filters that handle the high water flows effectively. That is; 20 micron pleated paper, 5 micron pleated paper, 5 micron coconut carbon and 1 micron meltblown.